The first sight that greets visitors is a gondola, filled to the brim with books! This amazing bookstore is located in the Sestiere Castello, in a narrow alleyway just steps from Campo Santa Maria Formosa, where you’re likely to encounter more Venetians than tourists. 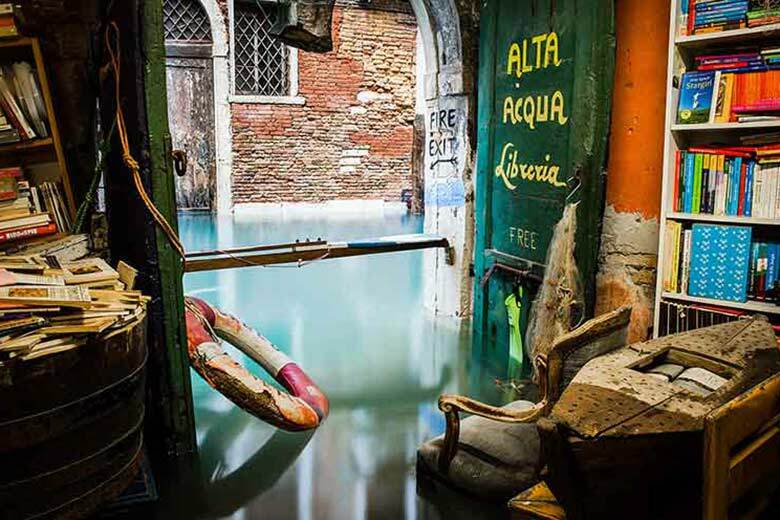 Apart from its matchless ambiance, the venue stocks an impressive selection of books including numerous volumes about Venice and its art and its history, as well as hundreds of new and used tomes that are really difficult to find elsewhere. Other highlights include posters, postcards and numerous other Venetian-themed objects. It’s nearly always open and ready to welcome visitors – you can browse its fabulous selection of books at leisure and even take photos because no-one will disturb you as you wander dreamily amidst its piles of printed paper. To complete the mysterious atmosphere, the store has become home to a number of stray cats who hang out on top of the stacks of books just waiting for you to take a photograph that will be posted worldwide.